In 1941 following some successful commando raids on Bruneval and St Nazaire it was decided to mount a significant amphibious raid on the coast of France. The destination of Dieppe was chosen. The assault troops for the raid were to come from 2nd Calgary Tank Regiment under the command of Major General Roberts. The Royal Navy and Royal Air force would supply fire power and personnel to cover the infantry landings. The layout of Dieppe with beaches and cliffs flanking each side of the harbour was very similar to West Bay and so it was chosen as the location to carry out a rehearsal. As dawn was breaking on June 12th 1942 Lyme Bay was filled with over 80 Royal Navy vessels carrying the 2nd Canadian Division to the landing beaches at West Bay. Looking at the same landscape 75 years on it is hard to imagine the scale of the operation. 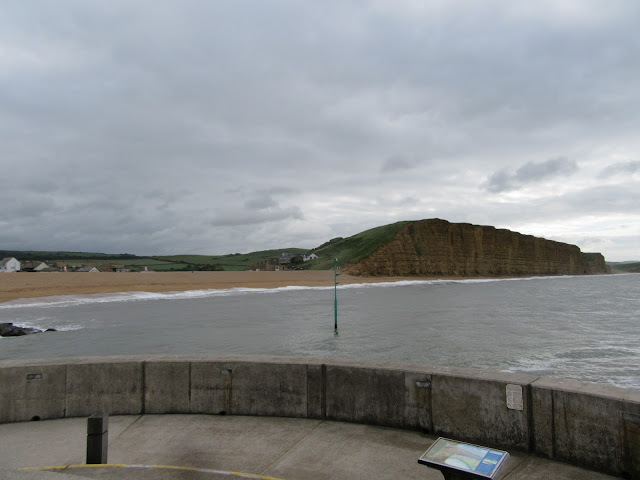 From top- Eype beach, Harbour & beach at West Bay and Burton Freshwater in the distance. 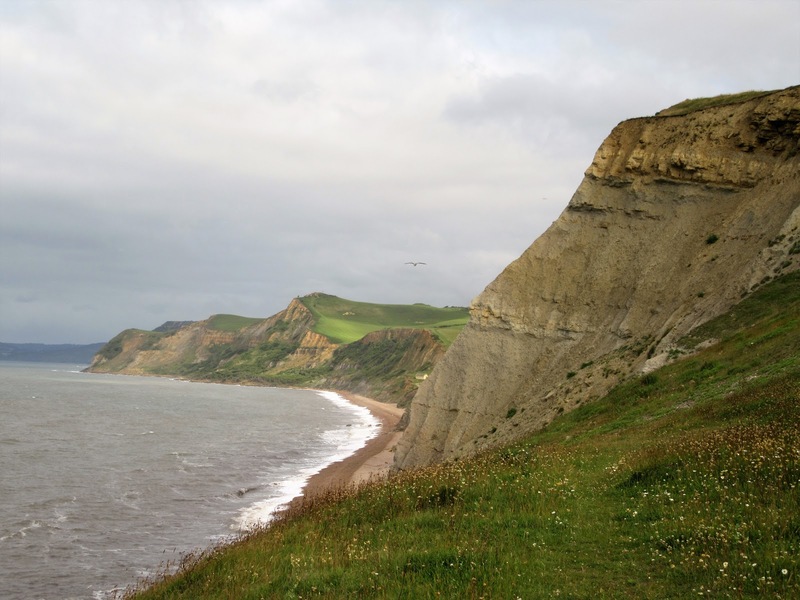 4,000 troops were landed on 3 beaches (Eype, West Bay and Burton Freshwater) These beaches represented the beaches of Puy, Dieppe and Portville. 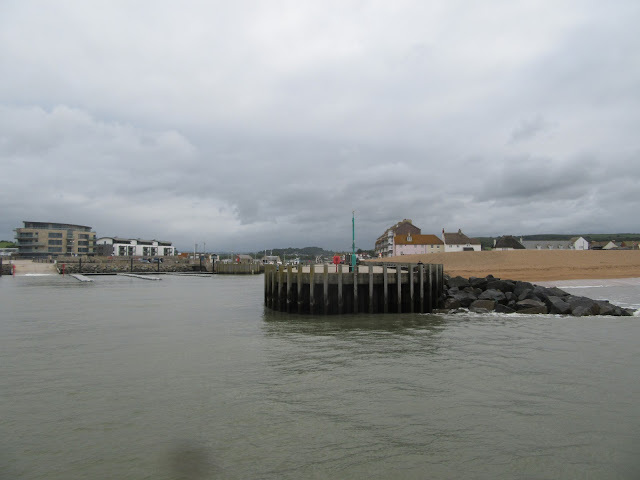 West Bay was a secure area during WW2 and passes were required to access the area. Those living in West Bay had to have a suitcase ready, as they could be moved out at any moment, one of these occasions was for Exercise Yukon. Not everyone was notified and the family living in the railway station were frightened when they looked out of their window and saw Canadian French speaking soldiers outside on the platform! Harmony was restored when the soldiers were invited in dry their socks beside the fire and have a cup of tea! Poor intelligence and communications between naval vessels meant that troops were landed late and on the wrong beaches and Exercise Yukon 1 was summed up as being 'Not altogether successful. 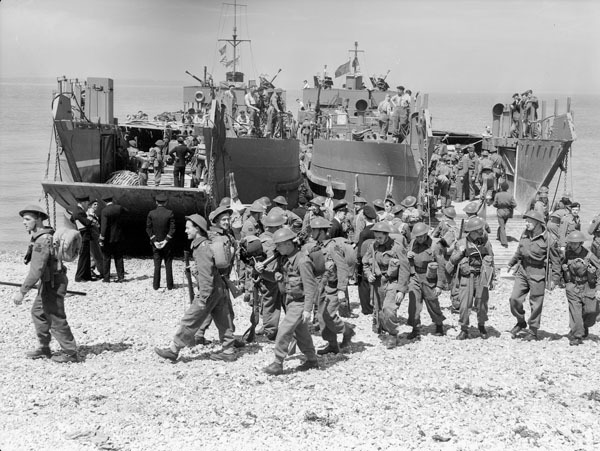 This put the Raid on Dieppe in jeopardy and it was therefore decided to repeat the Exercise ten days later. This time the rehearsal was overseen by Mountbatten, Montgomery and other Chiefs of staff and the operation was more successful. This was despite two buildings in West Bay being set on fire by smoke flares (Methodist Chapel and Bridport Arms Hotel) and a Canadian soldier firing a smoke rocket that narrowly missed Montgomery! Following Exercise Yukon the raid on Dieppe was approved and it took place on 19th August 1942. Of the 6,000 who took part in the landing 4,384 were killed wounded or missing - a loss of 73%. It was the worse single day for the Canadian Army in WW2. All the equipment landed on shore was lost, including all the Churchill tanks. The Royal Navy lost 550 men and 34 ships. The Royal Air Force in the largest single day battle of the war, flew 2,617 sorties and loss 106 planes. 48 civilians were killed and 102 injured. These days news of this scale would make headline news. 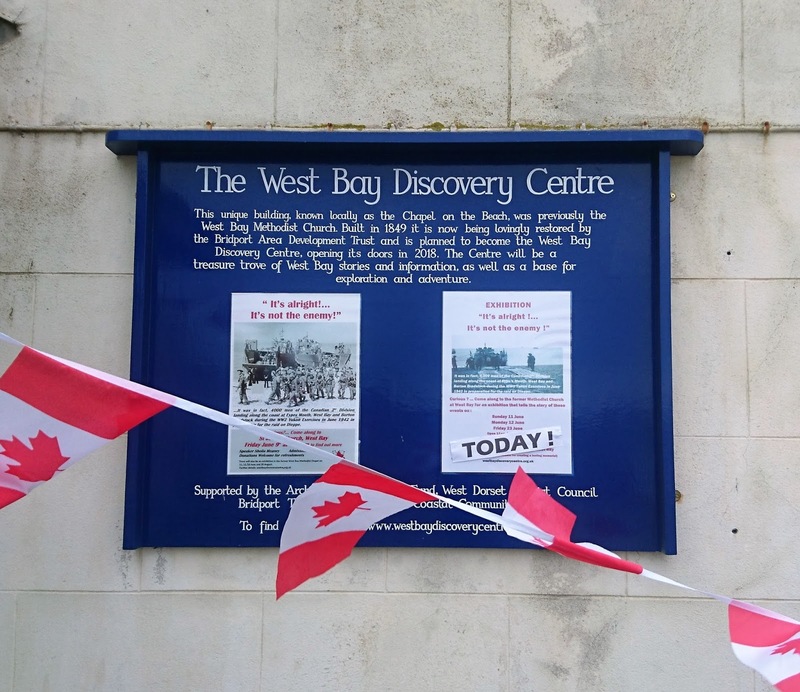 It has been a surprise to discover that this story is not well known and locals here were unaware of the role West Bay played in the Dieppe Raid. On the 75th Anniversary, a group of individuals got together to raise the profile of this story and get a permanent memorial placed in West Bay so the story of these young men who never returned home would not be forgotten. 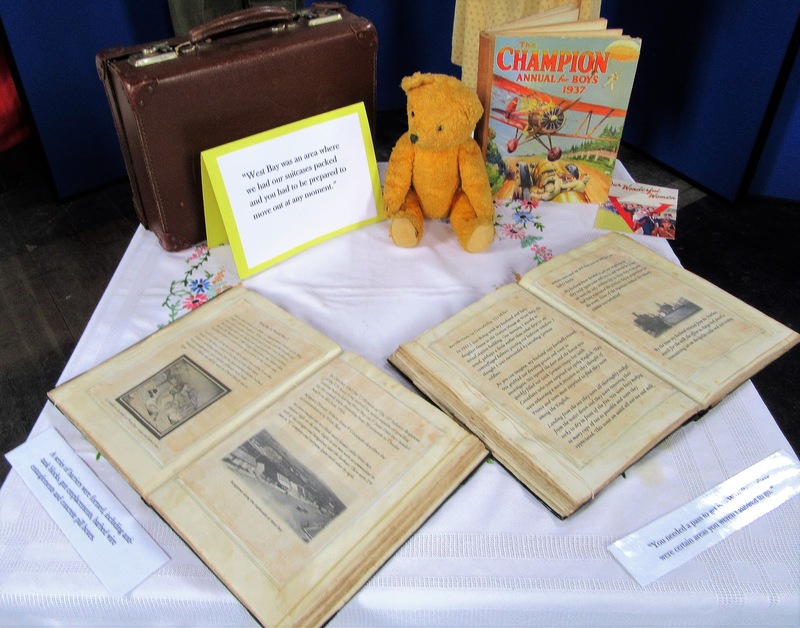 To raise money for this, a talk and exhibition have been held in the West Bay Discovery Centre, which was very well attended. 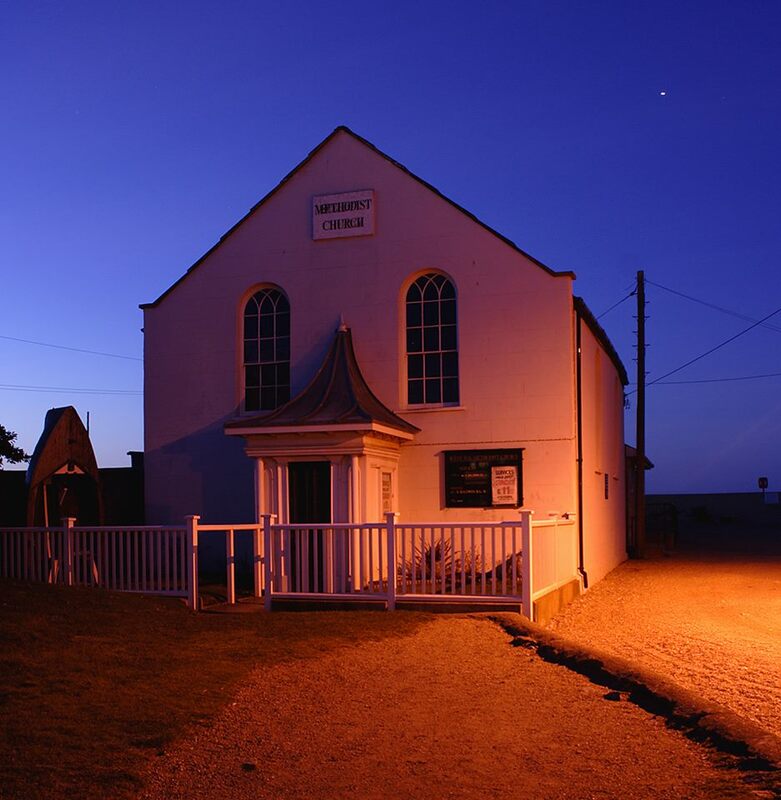 The Methodist church known as "the Chapel on the beach", was built by a local ship builder in 1849. The Chapel ceased to be a place of worship in 2007 and now belongs to Bridport Area Development Trust, which restores and re-uses historic buildings. 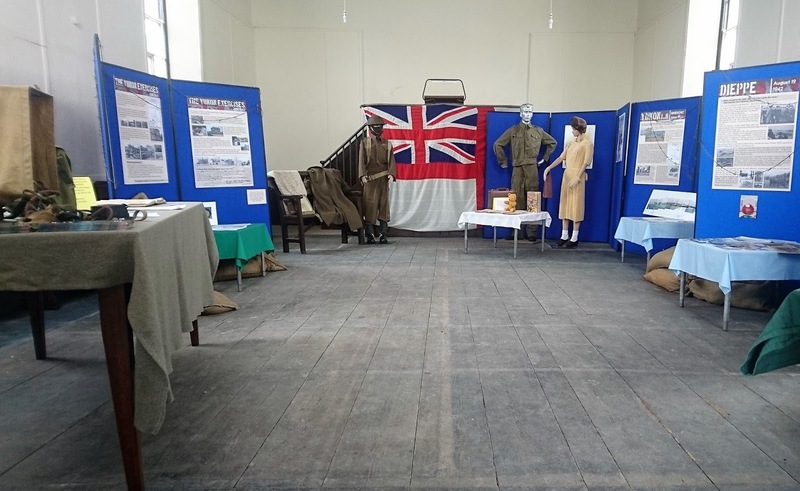 They have recently been awarded Coastal Community Funding to restore the building and adapt it as an innovative Discovery Centre. The Centre will tell the story of West Bay and will include other stories from the past, hopefully including more with happier endings! Glad to see a historic building put to good use, still serving the community, but in a different way. Amazing story ~ thanks for sharing! An interesting read. As a Canadian, thank you for this post. Thank you for posting this great story, Sarah. What a nice memorial to all those lost. I did not know the story. The losses were staggering. It is essential, isn't it, to never forget. If we forget our past, we only repeat it. But these days, even with the reminders, society does seem to have developed a new amnesia, and acts of inhumanity continue. What are we to do? Beautifully told, Sarah. You're absolutely right, we should not forget things like the Dieppe Raid. As to its value, I'm not sure that whatever lessons learned justified losses of that magnitude and have always suspected that Mountbatten put his own spin on it. All those Canadians did not need to die to tell us that a coast defended in depth necessitated overwhelming superiority in numbers, a robust logistical plan and control of the air. Good for you for writing this! Very interesting history lesson Sarah. ... and good to remember the lives lost in these exercises... I had no idea so many Canadians were involved.... As time goes on I can see how important it is to remember the sacrifices made for the peace and prosperity we take for granted. Thank you Sarah. I did not know about this despite living in the area all my life. Thank you for this post. I'm Canadian and Dieppe represents sacrifice. Many lessons were learned at Dieppe that made D-Day successful. There are several streets in our area named for places in France that were key in WWII - Dieppe Place, Falaise Crescent, Caen Road. I'm sure there are many more of them. It's interesting to learn of the role that English towns played in this exercise as well. And I loved seeing the bunting of Canadian flags! Thanks for posting this, Sarah, it's so important that we dont forget these awful events.